Generally speaking, at this time of year in China, most companies are preparing for the annual celebration. Speaking of the annual celebration, I think the most anticipated is the annual celebration programs, annual activities and annual bonus, right? Our PCBWay is also well prepared! You must be curious about our annual celebration, aren't you? Let me introduce you! The simple time table of PCBWay 2019 annual celebration is shown as below. How About the Annual Celebration? You must be as interested in the annual celebration programs and the lucky draw as I am, aren’t you? Oh my God! I can't wait to tell you the highlights of this celebration, which are the programs and lucky draw! Now, we’ll see where it takes us! 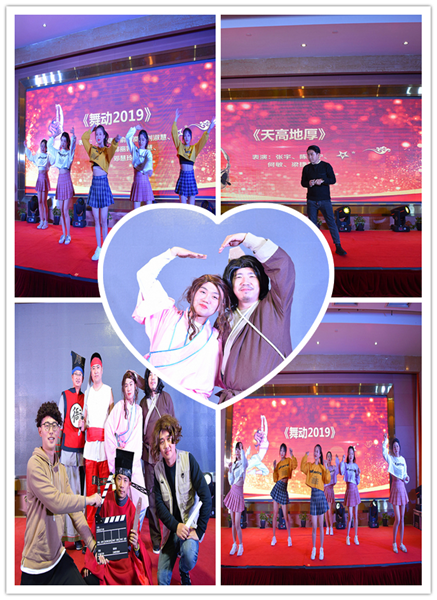 Since the annual celebration officially began, the hosts first introduced the distinguished guests who came to the scene, and invited Chairman Wang to deliver the opening speech. 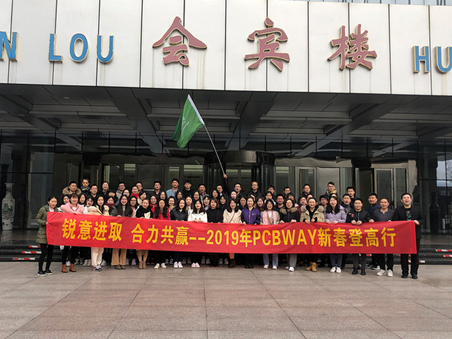 Chairman Wang introduced the development process of PCBWay to us, and described the various difficulties PCBWay has experienced, in order to encourage everyone to unite and forge ahead, so as to create a better future for the company! Then, it comes the exciting moment! That's the time to hand out the annual bonus! 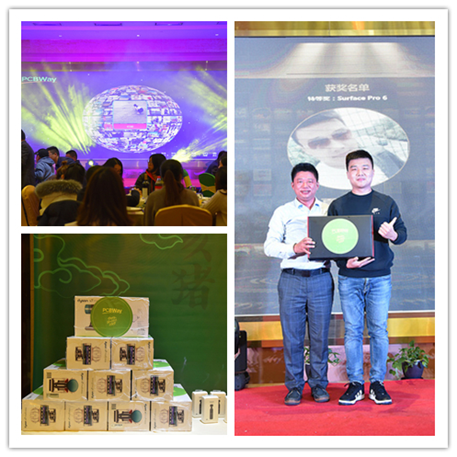 The host invited Chairman Wang to give out year-end bonus to all employees of the company! Everyone who took the stage to accept the award looked so happy! After receiving the annual bonus, we went back to our place and watched the programs happily. This year's show is full of tricks, including dancing, singing, skits and so on. Let's talk about the dance first. The dance is completed by the partners of several departments. This dance combines several popular songs and dance movements. Surely the sight of them bouncing and bursting with energy on the stage is still fresh in the minds of those present? Secondly, the most popular program should be the sketch, the sketch name is "Bao Erniang Saves Her Husband" is mainly created by a few boys from the development department and technology department. Here, I would like to introduce the heroine "Bao Erniang" in particular, you must have not thought of this "Bao Erniang" is the director of our development department—Anson Bao. Even now, when I think of him wearing a wig, wearing a skirt and wriggling waist walk cannot help laughing out loudly! Surely the guests and staff were also impressed by his cross-dressing performance? Finally, I would like to introduce the song "High Sky and Thick Earth ", which is song by Zhang Yu, the famous song god of PCBWay, together with his three right-hand men. His deep, steady voice also made it hard to let go. 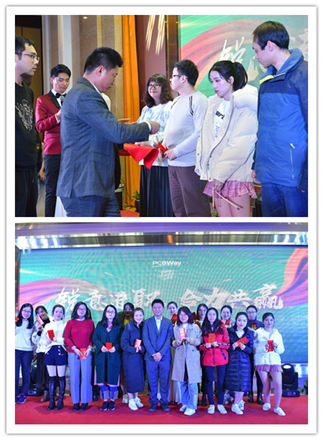 Every program is so excellent and so wonderful, unconsciously came to the annual lucky draw! I think, which may be the most attractive and exciting part of the annual celebration! Let's see what the prizes are this year! Wow! The prizes are Microsoft Surface Pro 6, HUAWEI Mate20 X, Dyson vacuum cleaners, Dyson hair driers and so on. Are you excited to see these prizes? Anyway, everyone in the annual celebration was very nervous at every lucky draw time, because we were all afraid that we would not be so lucky. But this time the prize-winning rate is still quite high. For example, six of the people at my table had won prizes! That means the chance of prize-winning this time might be 50%. 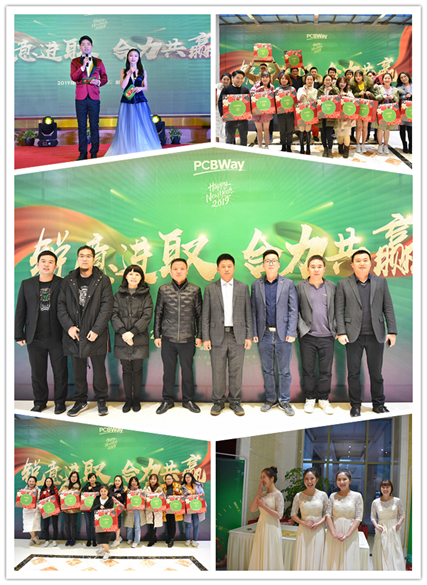 So nearly half of PCBWay employees were lucky enough to get the prize, but some unlucky colleagues didn't. 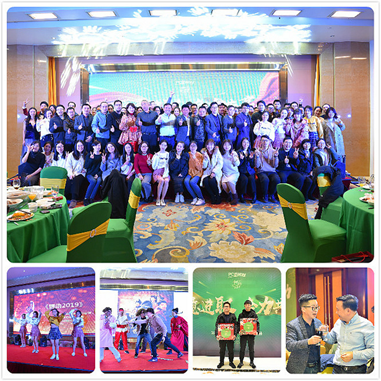 However, those who did not win the prize this time should not be disappointed, because the prize next year will be better than this year, as long as we can complete the company's performance more excellently. The annual celebration has come to an end quietly in the exciting lucky draw and wonderful programs. All of us are very reluctant to part with each other. Therefore, after the dinner party, we volunteered to take a group photo on the stage. But do you think this is the end of the annual meeting? No! Not yet! Another exciting event is just around the corner! Early in the morning of the 20th, we gathered at the hotel. Guess what we are going to do? That's right! We are going to climb Mount Huangshan! 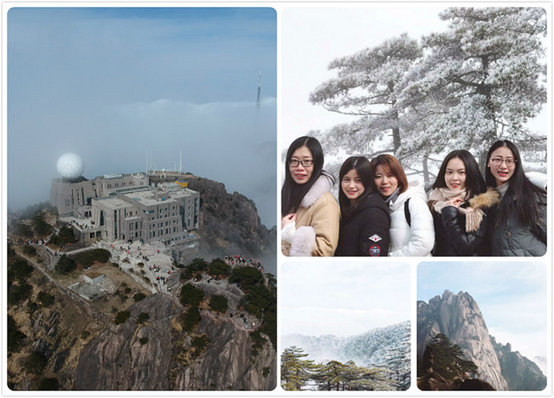 This is the first time for us to climb Mount Huangshan together, so everyone is looking forward to it.This trip to Mount Huangshan really made me unforgettable. You must be wondering why? Now, let me explain it. Early in the morning of the 20th, we got up and had breakfast in the hotel. I believe that many of you also like me, think that it only takes a few hours to climb the Mount Huangshan, and then we can return to the hotel to rest. But the fact is that we spent most of the whole day in climbing mountains! Oh my God! Can you believe it? However, I must say that the scenery of Mount Huangshan is very beautiful and attracted, just like a fairyland, shrouded in mist. There was a heavy cloud on the day we went. The guide took safety into consideration and asked us for our opinion, so that we could choose to walk or take the cable car up the mountain. Needless to say, except for seven brave employees, most of us chose to go up the mountain by cable car. But what I never expected was that even the cable car could not reach the top of the mountain directly. The view from the cable car is quite charming. The sun shone through thick clouds, and now and then a few beams of light fell on the trees and rocks, which were covered with a thin layer of ice mist because of the high altitude. In the sun, these slightly white trees appear very beautiful and pure, which makes us feel more and more relax and comfortable. After getting off the cable car, we walked to the restaurant on the top of the mountain, because we were going to have lunch there. However, due to a long time no exercise, I and several other colleagues did not keep up with the team. But it doesn't matter, we choose to chase the team and enjoy the scenery all the way. After lunch, we were still free. Since the guide said that we had to take the cable car down the mountain before 4pm, we decided to follow the route given by the guide and go down the mountain to the place where we took the cable car. But who knows, this part of the road is quite rugged. It not only has uphill but also has downhill, and sometimes even like a cliff as steep stone wall waiting for us to climb over. Can you imagine how we made it through the journey and got back safely to the hotel? To this day, I look back with horror. Anyway, we finally came back safely! Thanks God! When we returned to the hotel, it was already after 7pm, many people chose to take a bath in the hot spring to eliminate the fatigue of climbing, but others chose to go back to their rooms to rest. In a word, the hard but happy day is over, which also means that our annual meeting will end this year. What I most wanted to do was to have good sleep and came back to work! Finally, we are all very grateful to the planners of this annual celebration. Thank you for letting us have such a wonderful two days! Best wishes to you all! PS: In order to prevent the backlog of orders in the factory, our company specially arranged some production operators and business personnel on duty to deal with customers' problems. Therefore, if you have any problems with your order, please contact your customer service representative. 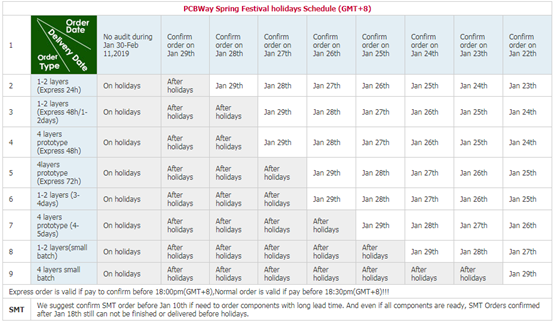 PCBWay Spring Festival’s Schedule is shown as below.